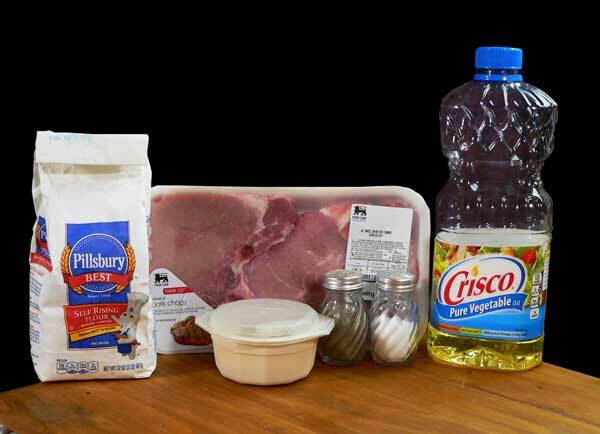 Follow our step-by-step, photo illustrated recipe to make our Pork Chops with Gravy. Printable recipe included. Delicious Pork Chops with pan Gravy made from scratch. Mama probably cooked pork chops for us about every other week when I was much younger. There were a good number of years when we raised about four pigs in a pen down below our house, so pork was often the meat of choice for her. Thankfully we had a large chest type freezer and could enjoy our home grown pork year round. Most often, Mama would fry up the pork chops for us. But, she would also make a pan of gravy to go along with it using the bits of meat and breading left in the pan from frying them. The gravy was generally served separately on her table. Then again, when she wasn’t cooking for that large Sunday crowd, she would put the chops back in the pan and simmer them along with the gravy. They were super delicious to me, either way she made them. You can do these that way if you wish. Just fry the chops until they are done, then remove them from the pan. Set them aside while you make the gravy. They’ll be great that way too. I realize lots of folks are afraid to make pan gravy. It might take you a time or two to get the hang of it, but really, it’s very easy to make. I do hope you’ll try it. You can make the gravy with broth or milk instead of using water. It will be a bit more rich in flavor that way. Often though, broth or milk weren’t readily available back in the old days. Water was the easiest to use. Just taste it before serving to see if it needs a bit more salt or black pepper. Ready to fry up some pork chops? Alright then, let’s head on out to the kitchen, and… Let’s Get Cooking. Pan Fried Pork Chops with homemade Gravy. You’ll need these ingredients. 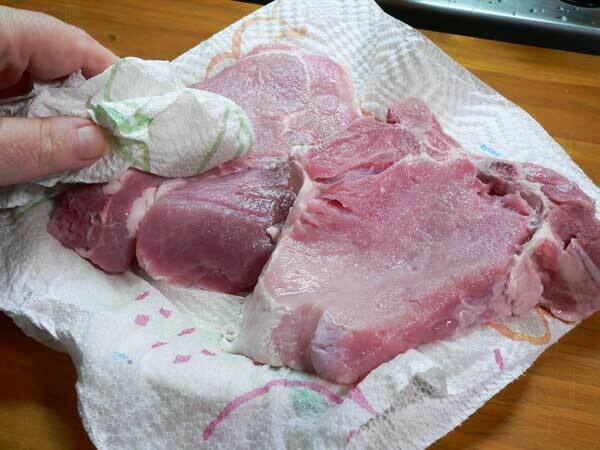 Begin by rinsing the pork chops under cold running water. Pat the chops dry with paper towels. When he’s making his barbecue, my brother always says that pork needs salt. I almost cringe sometimes watching him add salt to the chopped pork, but it always turns out great. 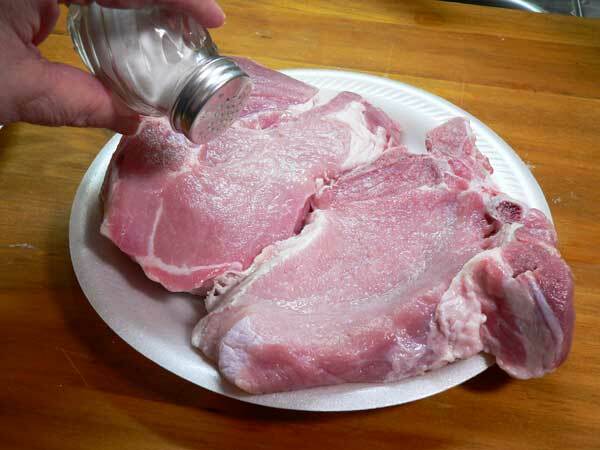 I suggest you go a little heavier on the salt and pepper when preparing your pork chops. You’ll enjoy the flavor. And sprinkle both sides with some black pepper. 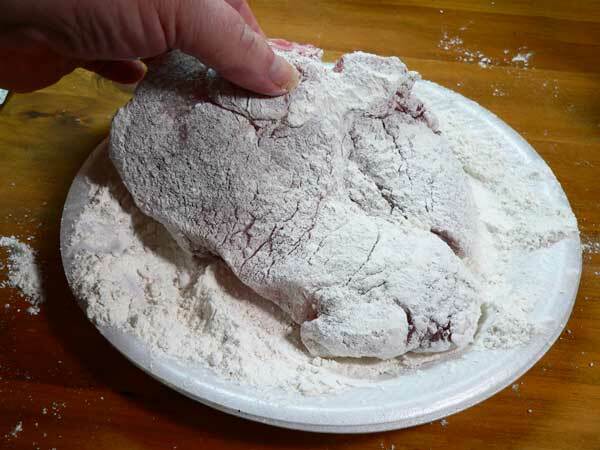 Place the flour in a container large enough to place your pork chop in. Dredge the chop in the flour. These pork chops were huge. They almost fill the plate as you can see, and they were about an inch thick. It was like a T-Bone Pork Chop. Yes, I prefer the bone-in, but I’ll normally buy what’s on sale. Smile. Flip it over and coat the other side with flour. Be sure to coat the edges with flour as well. Shake off any excess flour when done. Place the coated pork chops on a wire rack. Let them rest for 15 minutes. This will help the flour cling to the chops better once it hits the frying pan. It will also let the chops come closer to room temperature so they will cook more evenly. Place a skillet over Medium heat on your stove top. When the pan gets hot, add just enough oil to lightly coat the bottom of the pan. 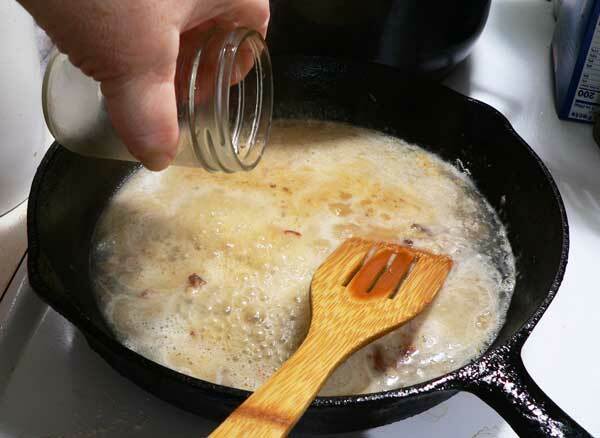 If desired, add a Tablespoon of bacon grease for added flavor. Once the oil is hot, gently place the chops in the skillet. Depending on the thickness of your chops, they will need to cook between 4 to 6 minutes per side. These were almost an inch thick, so I let them cook about 6 minutes. Then, use some tongs to flip them over in the skillet. We’re just browning them and searing them a bit to hold in the juices. We’ll cook them more a little later so they don’t have to be done at this point. 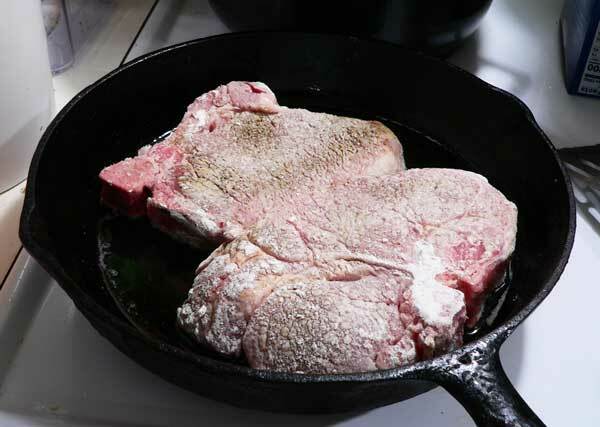 When both sides have browned, remove the chops from the skillet and let them rest on a plate or pan. 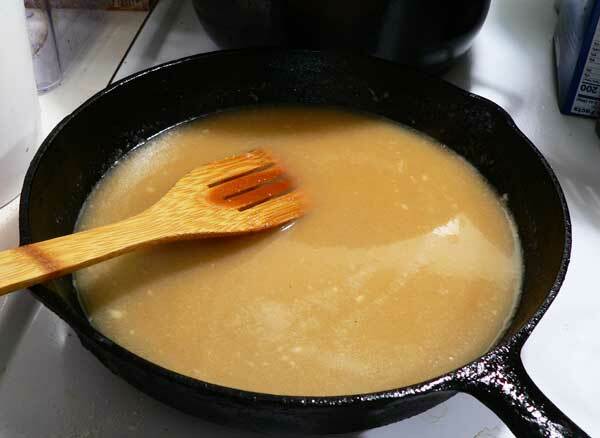 To Make The Pan Gravy: You need to leave about 3 Tablespoons of oil in the pan. If you have too much, then drain it off. If you don’t think you have that much in the pan, add enough butter or bacon grease to equal the three Tablespoons. Leave the hard bits, they are full of flavor. Then, add Two to Three Tablespoons of flour to the skillet. Sprinkle it around the pan. Quickly stir the flour and the grease together. I like using this flat ended wooden tool to make gravy. I can stir the flour and grease while scraping the bottom of the pan to mix in the hard bits left from frying the pork chops. Let the flour cook and lightly brown for about one minute. The darker you let the flour get, the darker your gravy will be. Just don’t let it burn. Smile. Gradually add the warm water to the skillet, stirring quickly to remove any lumps that form. Once the water hits the pan, the bits stuck to the bottom will loosen fairly easily. Just keep stirring, and keep adding water until it’s mixed well. If you stir it quickly enough, you will dissolve any lumps that might have tried to form. Continue to stir the gravy and let it come back up to a slight boil. Place the pork chops back in the skillet. 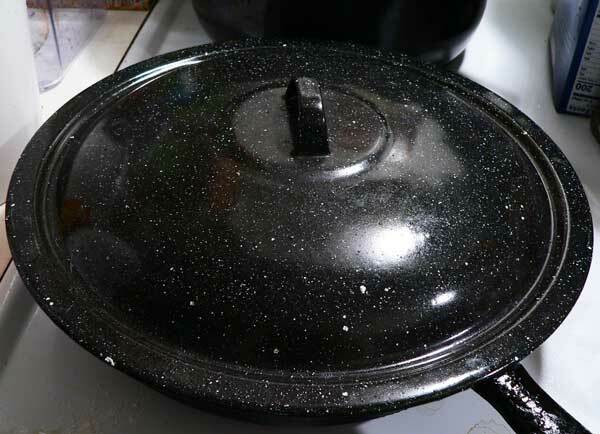 Cover the skillet with a lid. Reduce the heat just a bit and let the chops and gravy simmer for about 20 minutes or until the chops are done and tender. If your gravy isn’t as thick as you like, this might help. 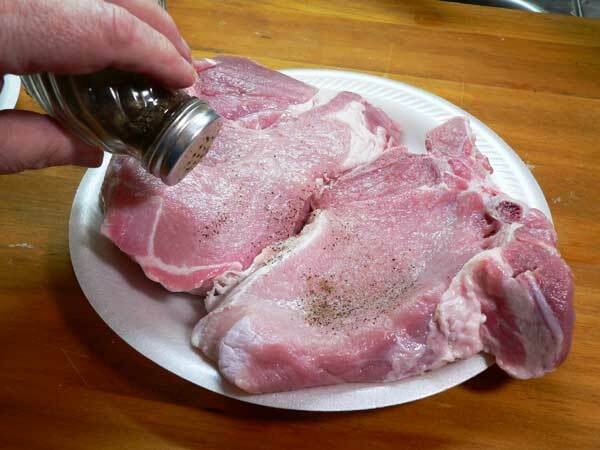 Remove the pork chops from the skillet. Place about 2 Tablespoons of Flour or Corn Starch in a small bowl. Add just enough water to make it soupy and stir it up well. Gradually begin stirring this mixture into your gravy. Don’t do it all at once, but gradually, stirring quickly to avoid making any lumps. Let it simmer another minute or two and it should thicken up. Taste the gravy to see if it needs more salt or black pepper before serving. I’ve served these up with our Southern Fried Potatoes, and easy Biscuit Bread. It would be great served with rice or mashed potatoes. What’s your favorite? 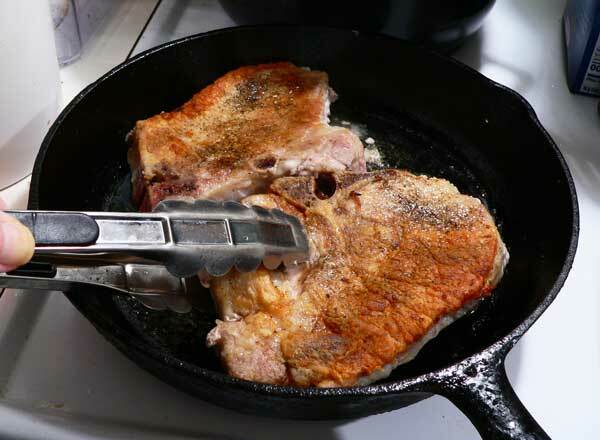 Step-by-step, photo illustrated instructions for making Fried Pork Chops with Pan Gravy. 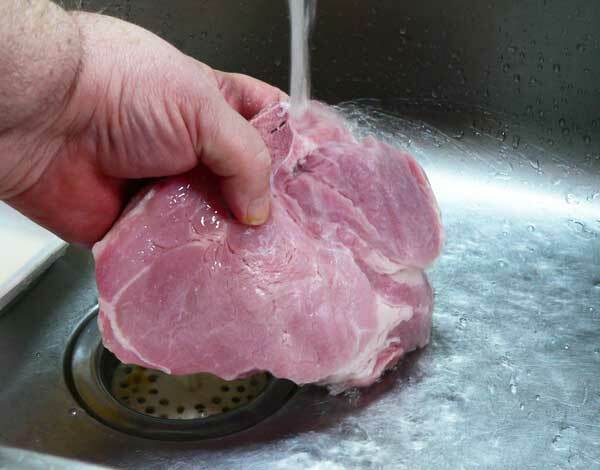 Rinse the pork chops under cool running water. Place on paper towels and pat dry. Sprinkle the chops with salt and black pepper to taste. 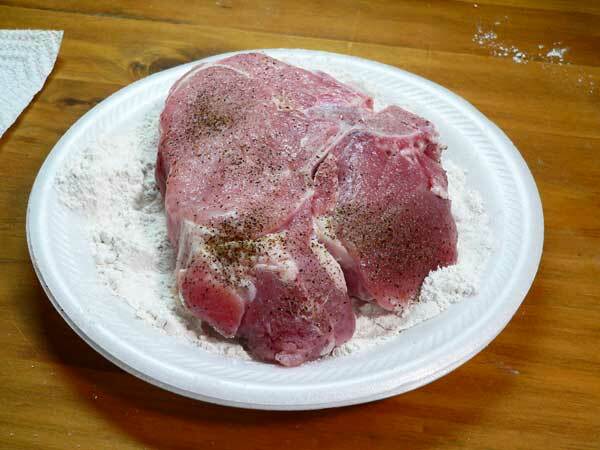 Place the flour in a small container to dredge the chops in. Coat each chop lightly with the flour mixture, on both sides and edges. Place the chops on a wire rack. Let rest for about 15 minutes. Place your skillet over Medium heat on your stove top. When pan is hot, add your oil of choice, and the bacon grease. When oil is hot, carefully add the chops to the skillet. Let the chops brown on both sides, about 4 minutes each side depending on thickness. 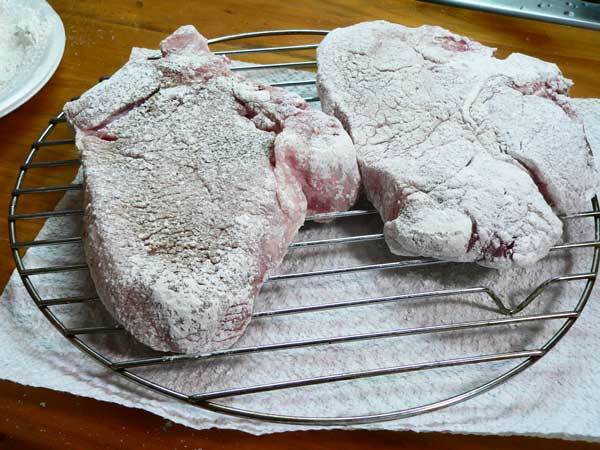 Remove chops from pan and place on a plate. 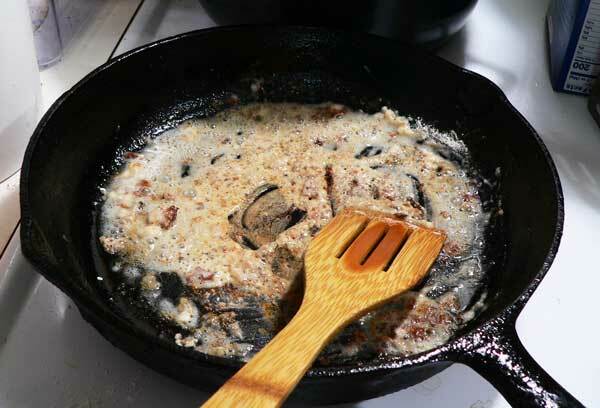 Remove all but about 3 Tablespoons of oil from the skillet. 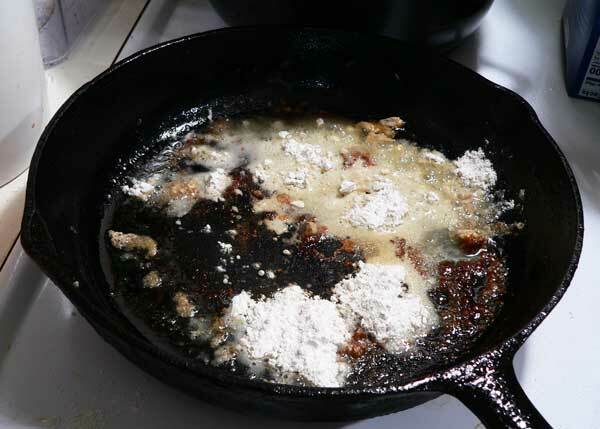 Sprinkle about 2 Tablespoons of flour over the oil in the skillet. Quickly stir the flour into the oil and let it brown for about one minute. Add the hot water, stirring vigorously to remove any lumps. 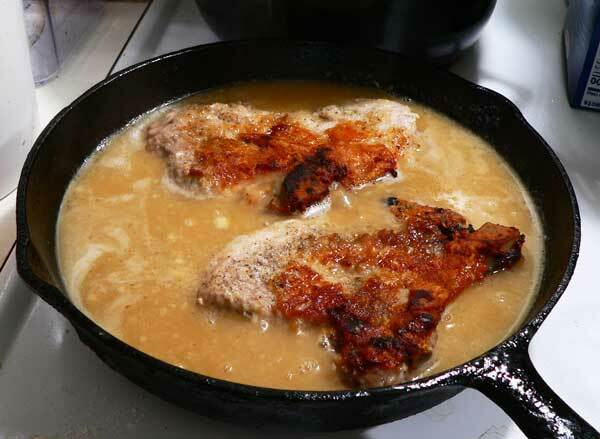 Place the pork chops back in the skillet with the gravy. REDUCE the heat. Cover the skillet. Let pork chops simmer covered, for about 20 minutes or until tender and done. How do you like your pork chops? Have you tried them with homemade pan gravy? Mouth watering ! I however do not enjoy this dish except in pictures. I am on a salt restricted diet, so anything requiring a salt shaker or even bacon grease I must be very careful with. Delicious! I made this today and they were the most tender chops we can remember having in a long time. I had forgotten how good a pork chop simmered in gravy was. I fixed mine just as you said, and it held on to the breading perfectly. The bottom did come off while it simmered, but that was just fine with us. Thank you for posting this recipe and reminding me of how good a ‘simmered in gravy’ chop is! 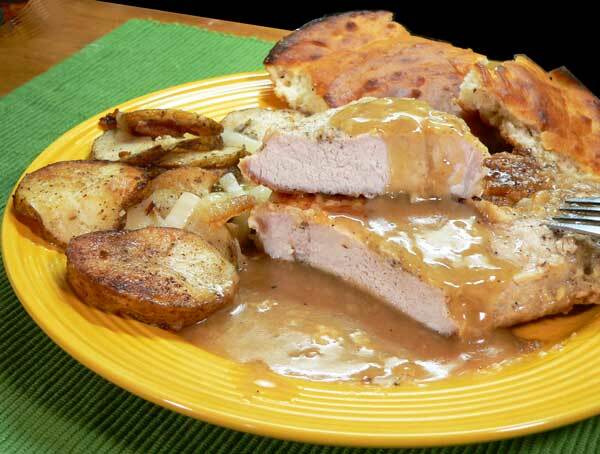 Pork Chops and gravy are a favorite – especially smothered w/ caramelized onions. Thanks. I use milk, maybe half ‘n half, when making my gravy. I’ve never used water. Does it taste just as good? Thanks, love all your recipes!! 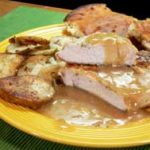 Pork chops are one of my favorites, especially with pan gravy. But I like them plain, cooked with tomatoes, peppers and onions, and any other way they can be prepared. Yum! !